The Grafenegg Festival is 10 years old this summer. The festival, based at Grafenegg Castle in Lower Austria, is one of those events where circumstances seem to have just come together, the will to create the festival, the venue, the money and the artistic input. There were celebrations for the birthday at the Austrian Residence in London on 4 May 2016 hosted by the Austrian Ambassador to the Court of St James, Martin Eichinger, a reception attended by Rudolf Buchbinder, artistic director of the festival, and Marshall Marcus, CEO of the European Union Youth Orchestra (EUYO). 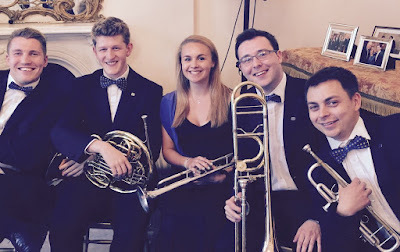 We learned more about the festival as well as listening to music performed by members of a brass quintet from the EUYO (Matilda Lloyd - trumpet, Tom Griffiths - trumpet, Joel Ashford - horn, Andrew McCoy - trombone, Ross Knight – tuba). Grafenegg Castle is the historic home of the Metternich family; the current owner is Tassilo Metternich-Sándor and his ancestor is the Prince Metternich who was the architect of the 1815 Vienna Congress. Set in lovely countryside by the Danube, an hour from Vienna, the setting provides local wine, gastronomy and history alongside the music, with a plethora of venues in the castle and grounds. The castle itself provides rehearsal spaces, as well as space for chamber music concerts in the castle courtyard, whilst the auditorium, the riding-school and the Wolkenturm are the three main performance spaces. The Wolkenturm is a spectacular outdoor stage, truly 21st century intervention in the landscape. Musically the festival includes many major artists, and this year can look forward to Bryn Terfel, Angela Denoke, Camilla Nylund, Katia and Marielle Labeque playing with the EUYO conducted by Vasily Petrenko, Franz Welser-Most and the Cleveland Orchestra, Gianandrea Noseda and the London Symphony Orchestra, and Rudolf Buchbinder directing the Vienna Philharmoni Orchestra from the keyboard in all of Beethoven's piano concertos, whilst the Tonkunstler Orchestra plays in many of the concerts. The festival runs from 19 August to 11 September, with a Midsummer Gala on 16 & 17 June, and events on Saturdays from 25 June. And outside of this period there are other activities, many based on the festival's youth programme as well as a concert series from the Tonkunstler Orchestra. The European Union Youth Orchestra is resident at the festival and at the celebrations at the Austrian Residence, Marshall Marcus (CEO of the EUYO) described Grafenegg as the orchestra's home (with representatives from the 28 EU Nations, the orchestra needs a home central to Europe). They are not the only young people involved in the festival, as part of the Grafenegg Campus education initiative musicians come from all over Europe, where projects include the composer-conductor workshop INK STILL WET plus collaboration with the European Chamber Music Academy, and with the Youth Symphony of Lower Austria. The composer in residence at the festival this year is Christian Jost, and he will be working with five young musicians in the composer-conductor workshop. This year there is a composition competition and the winner will get performances at Grafenegg and in the Musikverein in Vienna with the Tonkunstler Orchestra. At the Austrian Residence, the speeches were interleaved with music from the brass quintet from the EUYO who performed a programme mixing ancient and modern with renaissance dances by Salzedo, music from Jan Koetsier's Kinderzirkus, a quintet by Michael Kamen and finishing with sparkling performances of movements from Samuel Scheidt's Battle Suite. As the Austrian Ambassador Martin Eichinger said, with Grafenegg an hour from Vienna and Vienna a two hour flight from London, it is easy to go for the weekend. So what are we waiting for!